[Fabio M Costa] What are Your Choices When Purchasing an Embroidery Machine? Generally, there are two types of embroidery machines with almost the same functionality. There is the embroidery machine whose task is only to do embroidery and then the embroidery sewing machine which is versatile. It can do both embroidery and sewing. These machines decorate and add unique styles to fabrics. There are many brands of these machines and they come in different sizes. If you want to purchase an embroidery machine, you need to keep in mind that they come in different prices. Embroidery sewing machines are quiet expensive more than the embroidery-only machines. Prices of these machines mainly depend on the size of the machines itself and also the size of embroidery. They range from $200 to about $8000 dollars. It is important to also consider the functionality of the machine. If you want to take home an embroidery machine, ask yourself what you want to do with it. 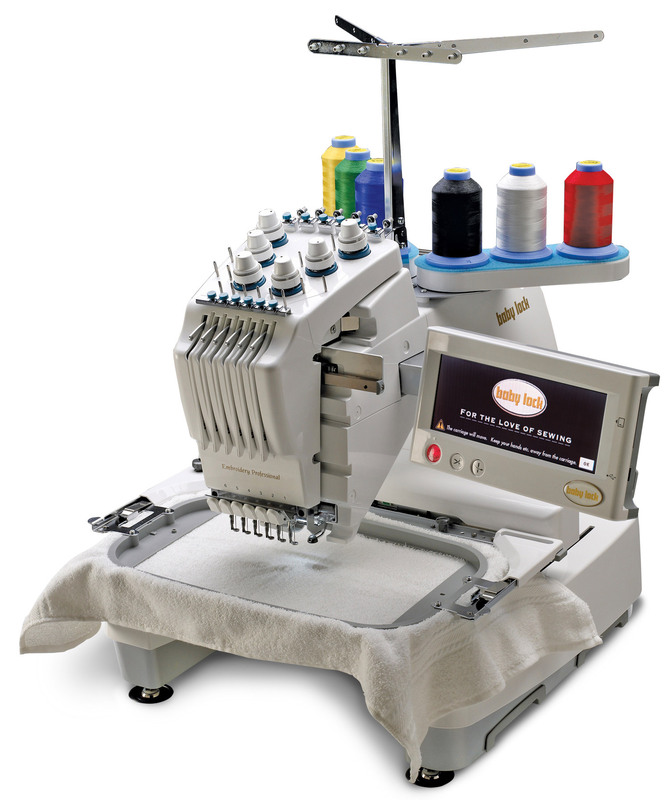 If you are specifically oriented in embroidery work alone, then opt for the embroidery only machine. However, if you want an all-in-one machine that will give you the privilege of sewing and also adding embroidery on the fabric, then an embroidery sewing machine will be the best option. Embroidery sewing machines usually have hoops. During embroidery the fabric is attached to the hoops that are connected to the sewing machines. These hoops hold the fabric firmly to prevent any movements until the machine finishes crafting the desired design. On the other hand, embroidery only machines lack a tool to hold the fabric. Instead, they are fitted with stabilizers. Some of these stabilizers are found on top of the fabric, while others are found under the fabric. Heat away stabilizers are usually recommended because they leave no trace when ironed. Some of the embroidery sewing machines are fitted with stitch regulators which enhances more stitches for the sewers who prefer the free motion embroidery. 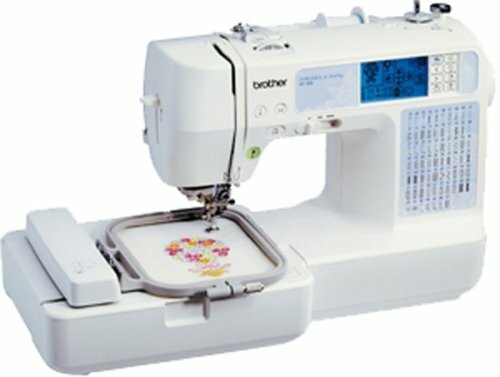 This is the simplest style of embroidery sewing machines. They were invented almost 200 years ago and are still used up to date. They were manually controlled by a rotary wheel. The most common brands still on the market are Brother and Singer. A number of people still prefer to use these embroidery sewing machines. These machines are not so easy to work with. You need to have a mastery of high skills in embroidery. These embroidery sewing machines have a few numbers of stitches. One of the major advantages is that there quiet cheap as compared to the others. So if you are facing financial constraints, this will be your best alternative. These embroidery machines come in handy when creating antiques and vintage pieces. This machine is more popular than the mechanical one. 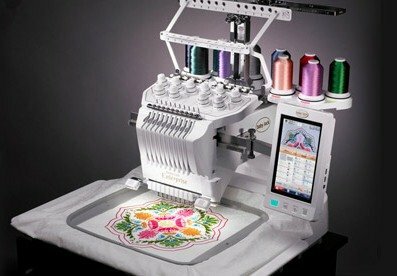 Quiet a number of people who practice embroidery prefer using electronic embroidery sewing machine because it is easier to operate. They are lighter, convenient and easy to carry. An added advantage is that they have more stitches than the mechanical ones and also have a number of more accessories. This machine widens the scope of your creativity because it is easy to manipulate. Hence, it allows you to be more creative and come up with extra designs. Available models include Brother, Singer, Viking and Kenmore. In the modern era, technology has evolved a great deal. It has made these machines very easy to use. They use a very advanced form of technology to function. You can easily make a complex design that would have taken days to craft using hands in a matter of minutes. These embroidery machines are very expensive but they render services that are worth your money. It also has added features like USB ports and allows internet connection where you can download desired patterns. These machines contain a microprocessor that allows you store patterns from a card and create the patterns on its own. The only disadvantage being the pricing, this is the ideal embroidery machine for you, whether for commercial purposes or personal reasons. Some of the common models include Singer CE-200 Quantum Futura, Brother SE270D and Singer Quantum XL-6000. In conclusion, you should critically analyse whether you want an embroidery sewing machine or embroidery only machine. Ask yourself for what purposes do you need it. Take it to consideration your needs and budget. Also do a thorough market research of what best brand will bring you satisfaction because different models have different features. Then with all that in mind, find a reputable dealer, make an informed purchase and put your embroidery skills into use. At the beginning of this year we created a group on our video engineering team to deal with the ingesting, encoding, publishing and syndication of The New York Times videos. The main goal of the team was to build a pipeline that is vendor agnostic, cloud-based, efficient and elastic. We also wanted to build an easier workflow for video producers in the newsroom and third-party partners who distribute our videos. We named this team Media Factory. After a few months of development, the pipeline is almost ready to be deployed to production. It consists of three different steps: Content Acquisition, Transcoding and Distribution. The content acquisition part is responsible for receiving ProRes/Raw videos, the transcoding API transforms the source files in playable videos by our supported browsers and devices and the distribution step sends the final videos to our CDN. Probably the most important and complex part of the pipeline is the transcoding process. Instead of using heavy and expensive hardware for that we decided to create clients for different encoding services like Encoding.com, Elastic Transcoder and Elemental. This enabled us to decide which one to use based on a set of variables such as availability, speed, formats supported (HLS, webm, mp4, DASH, etc) and even cost. While discussing the design of the pipeline and the integration with cloud services, we thought it would be useful (and FUN!) to implement another provider that would be just a tiny wrapper for FFmpeg or GStreamer. By using this tiny wrapper, we would have the freedom to deploy anywhere, implement new features (such as the generation of thumbnails) and perhaps, one day, be used to encode our lower priority jobs. We have plans to write a blog post about the details of each step and how they work together on the Open Blog. We should work on that as soon as we have people at the company using the pipeline. After having a lot of fun on the journey to remove Flash from our player I got attracted by the chance to be part of this team. I was already willing to work with back-end services again and knowing that the company is adopting Go for API’s turned this opportunity into something even more attractive. Although I was participating on meetings and design decisions, I actually started working on the team in April. I had never worked with Go before and after a few years plunged on dynamically typed languages I felt a bit of pain during the first steps working with it. The rest of the team was already fluent and I though I’d need something to exercise myself and keep up with the team’s pace. Creating this dummy provider that is a wrapper for FFmpeg seemed like a good chance for me to evolve my Go skills. A month ago I started writting it, I called the project Snickers. I put this name because it’s my favorite chocolate and I was holding one when I created the GitHub repository. To be honest, the title of this post doesn’t actually represent the current state of the project. Right now, it looks much more like a proof-of-concept/embryo project than anything else. It supports the download of sources from HTTP and Amazon S3, encode them in H264/MP4 or VP8/WebM using a FFmpeg binding and uploads the results to Amazon S3. We still need a plethora of features to be able to actually call it a Media Encoding API, but one of the purposes of this post is to broadcast the idea and try to engage people to collaborate. Snickers already has contributors! I’m also interested in working on the creation of a GStreamer driver for the encoding part so we can have benchmarks using different drivers. I saw that there’s already a Gstreamer binding for Go and it seems that the code is simpler than handling libav calls. You can find some instructions on how to deploy and use the API as well as some examples. I also labeled a bunch of relatively easy issues in case you want to work on and be part of this project. It’s been a while since I eye on cooking under vacuum at low temperature. It is a technique that is found in many recipes because it is perhaps the most cooking that respects the product and even improves its quality to some extent. Last weekend I tasted my first meat cooked at low temperature in a restaurant. A piece of veal fillet of exceptionally tender, never eaten like this, cooked several hours at 55 ° C under vacuum in a water bath. I hesitated, but it convinced me!!! There are two types of devices for evacuating the outer suction machines and chamber machines. The machines bell are those that equip professionals because it allows a very high vacuum, setting liquids vacuum, the use of cheap plastic bags, but among the faults, for the particular, there is the very high price. And even if the price was not an obstacle such materials are imposing and heavy, they will not fall in a closet after use!!! The machines external suction is against much less bulky, lighter and cheaper. In return they are less efficient, the vacuum is less extensive, and they should be frozen liquids and strong moist products before putting them under vacuum. It is also mandatory to use embossed bags more expensive than plain bags. But overall, unless you make more than a dozen vacuumed daily, buying a family suction machine confine most of us and this type of material I choose. In this market, there are all less than 30 € more than 200 € for certain professional boundary machines. Looking on the internet, I came across demonstration videos of the FoodSaver brand, a brand that seems well known in the USA, obviously with a good reputation for quality and reliability. Three models are from 85 € to 160 €. The differences lie in the possibility of manual adjustment of vacuum and particularly on the model Food Saver v4880 on which we can control the power vacuum. This model is cumbersome, but the roll of bags can stay inside, and it can be stored in the vertical. This is the model that I chose. 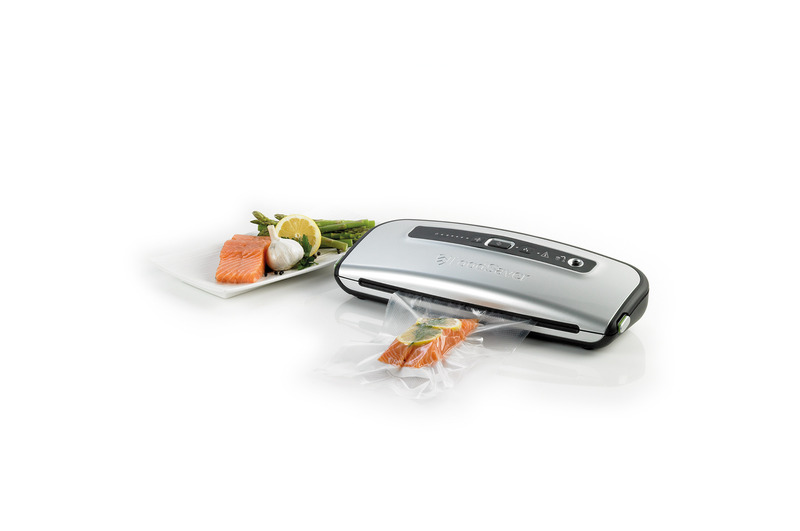 Click here for the full foodsaver v4880 review. I forgot to mention that the vacuum is not only for slow cooking purpose but also improving food preservation, especially when oneself frozen. Often your frozen products make water which crystallizes on the surface, they dry, take not terrible and ultimately smells good to throw away. With the FoodSaver vacuum Announces Conservation 2 to 3 years for frozen houses. For wet products such as fish, it is advisable to freeze the product quickly before putting it under vacuum to prevent the liquid from being sucked by the pump and destroy it forever. There is good security in the FoodSaver with a groove that holds the liquid and crumbs before they pass through the pump, but I do not amuse me to test the effectiveness of the device!!! For bags, it is mandatory to use embossed bags that cost a bit more expensive than smooth bags. The roller supplied as standard can already do some evacuated and then contrary to what one might believe it is cheaper to buy ready-made bags that roll, it’s almost 2x less! I made my first test of low temperature cooking with a piece of pork tenderloin, evacuated, and then baked for 4 hours in a steam oven at 70 ° C. Since I did not yet control this type of cooking I assured the blow by sticking a probe in the heart of the net, through the plastic. The bag remained well sealed despite the hole, and I think that the rest as we do not touch the probe. I pulled my bag from the oven when the temperature was at heart at 63 ° C at least 30 minutes. I did return the fillets to a hot pan with just olive oil net time to form a colored crust to taste through the Maillard reaction. And all comes fine! Beautiful pinkish color and flexibility are suggesting exceptionally tender. In the mouth, it is a rediscovery of pork. Fondant, a pinch of salt simply is outstanding, after that it will be difficult to eat pork cooked this way differently !!! During the past few months, you would have noticed that there is a cooking appliance that is catching everyone’s attention. This cooking tool is called the air fryer. As one of the latest home appliances in the market, it is becoming one of the trending tools to use in your kitchen. The air fryer currently comes in different brands and features, where you can pick the appliance that suits you the best. The air fryer appliance manages to catch everyone’s attention thanks to its revolutional function. One of its most noticeable features is its ability to cook food without oil. Unlike normal pans and the like where you would need to cook with oil, it is possible to forego that ingredient with the air fryer. The air fryer manages to utilize the circulating air around you to finish your dish. Even though its oil-free feature is its most known asset, you’ll also be happy to note that it is not the only benefit that it comes with. If you are wary about the usefulness of the air fryer, then look no further. This article not only provides tips and tricks to utilize your best air fryer , but it also includes different advantages and benefits that you can receive from this cooking appliance. From home safety tips to people who can benefit from the air fryer, this article would be able to provide you answers for any question that you have regarding the air fryer. We even wrote about some recipes and ingredients that can be cooked well with the air fryer. As one of the most useful cooking appliances in the market, the air fryer comes with different benefits that are perfect for anyone and everyone. However, the air fryer comes with some assets that are more beneficial to certain people. Look no further, as this list would include the types of people that would benefit from it. 1. People who prefer having minimal to zero oil in their dishes. Since the air fryer is mostly advertised for its oil free, healthy function, it goes without saying that anyone who prefers to have minimal oil in their cooking should buy this appliance. Since the air fryer can help you cook the dish that you want even without the use of oil, you would be able to use the air fryer regularly. Just because the air fryer doesn’t use oil in its cooking doesn’t mean that you can’t cook complicated dishes. Even with its oil-free feature, the air fryer can still create different dishes such as fries, stewed pork, and even roasted chicken. As long as you know how to handle it properly, you would be able to cook any recipe that you like. 2. People who want to multitask while cooking. Even though the air fryer is more similar to a frying pan than an oven in terms of physical appearance, the air fryer is more similar to the oven in terms of function. The air fryer is slightly intuitive as you can leave your dish in it from time to time. As long as you come back and check it up regularly, you can do other activities aside from preparing your dish. This is a good thing for multitaskers who do not have much time in their hands. If you are running late for any appointment, then you can simply let your air fryer finish the dish while you prepare your things. This is also a good cooking appliance to use when you have to take care of other activities at the time. 3. People who prefer to speed up their cooking time. Aside from its oil-free function, the air fryer has several other positive features. One of them is the ability of the air fryer to speed up your cooking time. Even without the use of oil for your cooking, you can be assured that your air fryer would not only finish cooking your food, but that it would also be able to speed up your cooking activity. Since the air fryer works by utilizing the surrounding heat, it can work faster than regular cooking appliance. With the air fryer, you can finish up a meal with half of the time that you can consume if you are to use a regular pan. This is especially useful when you are late for your next activities or when you want to eat food immediately. There is many reasons why a lot of people prefer to purchase the air fryer. Whether it is because of its appearance, its functions or even the trends, there is no doubting that the air fryer is one of the fastest selling home appliances in the market. As a great technological innovation for the home appliance industry, the air fryer doesn’t disappoint with the features that the model comes with. Its features are not only useful, but they are also wholly functional for your daily living. 1. The air fryer is easy to clean. Most people have a hard time cleaning up their cooking appliance after finishing up their meals. You wouldn’t need to experience the same difficulty with the air fryer. Since the air fryer rarely makes use of greasy materials in your cooking activities, it would be much easier to clean your air fryer. You wouldn’t need to worry about materials like grease and oil, which are both hard to wash away. You can finish cleaning up your appliance immediately as you would have a better washing experience. Since the air fryer also comes with the air filter, you can also be sure that your home appliance would not smell like smoke. Thanks to that feature, you can be assured that you can finish cleaning your air fryer with just a single wash.
2. The air fryer does not need oil to cook the dishes. When you first hear of the air fryer, this is the first feature that you will learn about it. As one of its most innovative uses, the air fryer has a function that lets you skimp on using oil for any dish that you will prepare. In fact, the air fryer endorses the use of zero to minimal oil as it can manage to cook food better without the use of oil. If you are thinking that the food that you made would taste differently, you do not have anything to worry about. Even though it does not use any oil, you can be assured that your meal would taste the same. 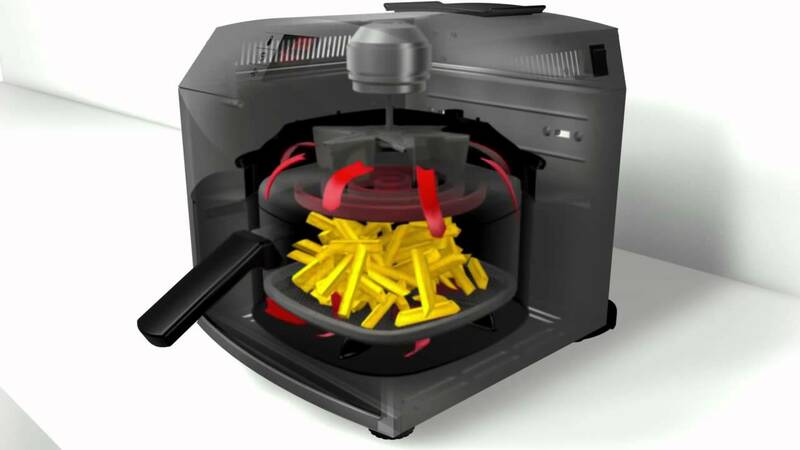 The air fryer simply replaces the use of oil with the use of its interior heat. The air fryer can not only create delicious meals for you, it can also assure that your current dish is much healthier than before. Because of its oil-free function, you can avoid having health problems and diseases that you can get from consuming too much oil. 3. The air fryer comes with its own air filter. If you have already looked into different air fryers in the market, then you would have realized that most air fryers come with their own filter. Aside from using the circulating air around the appliance to cook the food, the air fryer also filters the air surrounding it. If you are wondering what the use of the air filter is, then imagine the times that you have smelled like the meal that you were preparing. With the air filter that comes with this cooking appliance, you can avoid those situations. 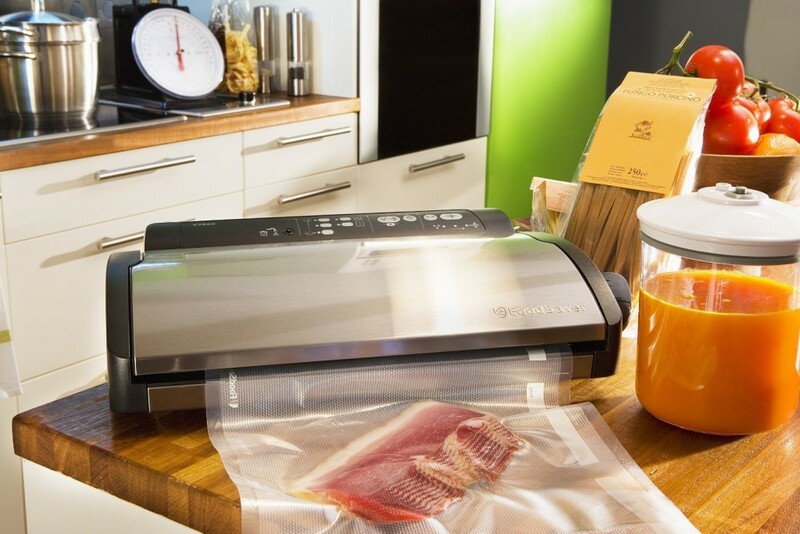 The air filter allows you to cook the food without worrying whether you or your room would smell like the dish that you are currently making. If you are going to buy your air fryer or if you already have one in your home, then you should know some tips and tricks to prolong the life of your air fryer. Even though the air fryer is not easily breakable, it is still better if you manage to take some precautions when you use it. The air fryer is a useful tool in the kitchen. It would be unfortunate if your cooking appliance would break by accident. If you want to use your conventional cooking appliance to the best of its abilities, then it would be a good idea to take care of it properly. Make sure that you follow these tips as it can help you use your air fryer for a longer duration. 1. Make sure that you read your manual before use. As with any appliance or even gadget that you have, it is better to read the manual first before you use your air fryer. Since the manual that came with your product contains the list of guidelines to properly utilize your tool, then it is a good idea to read it before using your air fryer. The safety manual is your bible when it comes to your air fryer. Aside from displaying warranties, it also has a list of the things that you should and should not do with your air fryer. If you read through the instruction booklet, then you are less likely to make mistakes that can cost the functionality of your air fryer. 2. Use your air fryer regularly. If you buy an air fryer, try to make it one of the primary tools that you use whenever you prepare your dish. Make sure that you don’t leave your air fryer unused for a log time because some of its internal circuits might take damage. It would be much better for you to use your air fryer when you cook. Leaving your air fryer to its box after an initial use would present several problems – from circuit breakages to minor electrocution. If you buy your new air fryer, you should use it when you cook your meal. While you don’t have to use it daily if you prefer not to, it is best for you and your air fryer if you use this appliance weekly to avoid disintegration. 3. Clean your air fryer with minimal water or liquid substances. When you clean your air fryer, try to use minimal water when you do so. In fact, it would be better if you use no water when it is time for you to clean your air fryer. Because the air fryer is an electronic device, it doesn’t work well with a lot of water on it. There are several hazardous incidents that may incur if you choose to use water to clean your air fryer. From product combustion to electrocution, there are heavy results for using water as a cleaning device. If you are wondering about what to use in cleaning your home appliance, then I advice you to use a cloth or a rag for cleaning purposes. Since the air fryer is easy to clean by itself, using the cloth would be enough to clean your cooking appliance. Since the air fryer can make any type of food that you want, here are some recommendations for recipes that you can work with your air fryer. From carbonara to chicken pesto, there are a lot of pasta meals that you can create with your air fryer. You can even make lasagna for special occasions. Whether you want to cook fried vegetables or soupy meals, you would be able to make it all with the air fryer. From mashed potatoes to fries, the list of vegetable recipes that you can create with the air fryer is endless. 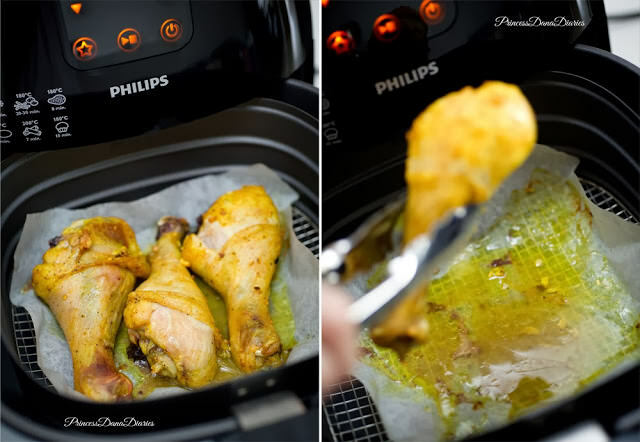 With the air fryer, you can not only create fried chicken but also roasted chicken. You can also cook difficult chicken recipes with your air fryer, as long as you have the necessary ingredients near you. You read this right. You can even create chocolate with the air fryer! As long as you have your cocoa and other ingredients ready, then you would be able to create a sweet delight for your friends and families. Jason L. Trevino is an expert in tool and equipment services who is the founder of zoniv.com. The portable vacuum cleaner involves prolonged physical work. It is rare on the market; this is due to the success of the canister vacuum. With this type of device, no need of an electrical outlet, for supplying power, simply plug it into the cigarette lighter of the car which sends electricity to 12 volts. 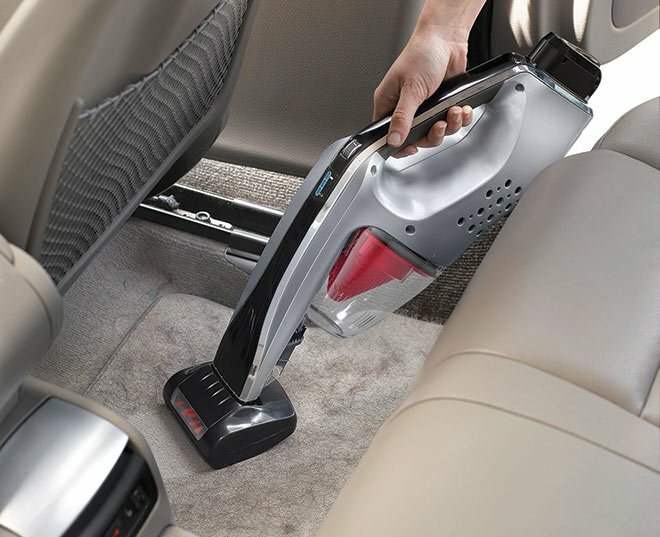 To help clean all the corners of the vehicle quietly, the cable length the device can reach two meters in length. It comes with a small carrying bag. Compact, it can be stowed in the trunk or glove box clutter.Also, the length of its cable offers it’s the opportunity to tour the vehicle. Menu, its beak creeps into every corner of the cabin. It needs no electrical outlet to operate, simply plug it into the cigarette lighter. 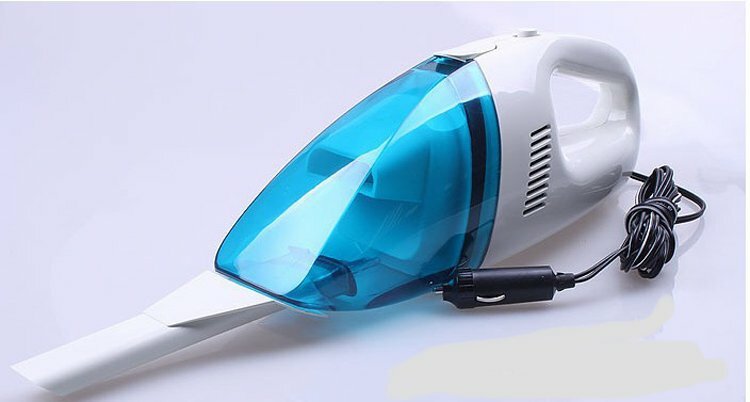 The main drawback of this vacuum cleaner is that it is not very powerful and therefore can be used in troubleshooting a conventional vacuum cleaner. On the Internet, you can access any device. This option is reserved for the customer who already has his idea of what he wants to buy. Compared to shops storefront, the difference is a matter of price. But before launching, it comes to checking certain precautions. When ordering at the time of payment, make sure the web page is secure (https address that starts with an image of a padlock in the browser’s bottom bar). Please ensure that the delivery price does not cover the benefits of the proposed reduction. In this case, the interest of the internet buying is zero. See terms of delivery: home delivery being done by appointment? Do you have the means to receive the driver during passing times? Open the package before the delivery person to see his presence in the state of delivery. Send the package immediately in case of surprises. Enjoy relay points or deposit: Some stores offer to deliver the item to a warehouse or business near you or your workplace. Thus, delivery is offered, or a small amount and you can pick up your package when you want. Check the warranty conditions; some brands refuse to assume the warranty of the items sold online. The price ranges from 10 Euros to 75 Euros. You will find below a summary table of prices on the market for all types of vacuum cleaner. Today we enter the heart of the matter because we will embroider a design with the computer embroidery machine! I chose a breathtaking free pattern made with four colors of thread (the steps that I will describe apparently remain the same regardless of the number of changes the pattern). This is a MANDATORY step. Be careful with the size of the pattern (observe proportions compared to the garment embroidered or object) and its location on the fabric. Tip: If you can, print your design in actual size to visualize its location. Otherwise, please refer to the pattern dimensions of the tissue or to create you a very simple template paper. I printed my motive, then placed the sheet under to assess its size and position. Then only make a mark on the fabric (usually, we take as a reference the center of the pattern, but it can happen that one may need to take the edges of the pattern as a guide, when embroiders series models for example). After scoring embroidery marks on the tissue, the “stuck” in the framework and that is where lies the thorny question, “Should I use a stabilizer material every time?”. In theory, professionals will tell you that yes, it’s better. Now I will give you my reflections on the subject. – You decorate delicate fabrics like organza or silk. In these two latter cases, it is even necessary to place a water-soluble on the fabric. But I will talk next time these particular situations. The fabric I chose was quite light and dense pattern, I stuck the water-soluble fabric reinforcement in my (with a little spritz of glue for embroidery there is no need to put too much), then j ‘I stuck my fabric and the stabilizer in the embroidery frame. To position it correctly in the frame, I used the plastic template provided. This grid allows you to place your fabric straight in the frame to check that the embroidery frame is correctly positioned and that the pattern itself is well understood in the embroidery field. Tip: I deliberately placed the center of my most downright design possible on my part because the model is relatively small compared to my surroundings, so I can recover a larger piece of water-soluble surplus after embroidery (for reuse with smaller frames, for example, or for sewing buttonholes). Once the fabric correctly in the frame is tightened the screw and pulling the sides of the fabric to remove any slack in the structure, it should not remain “beads” (remember to use the small key used unscrewing crowbars came with your machine to tighten the screws of the frame or even a screwdriver!). Be careful not to tighten either over, nor too soft fabric, the aim of the game is not able to make a tambourine !! If you have several changes of a son, put your spools in their “order of appearance” next to the machine, the color changes will be faster and be less likely to go wrong in the colors. It sets up the can (with special yarn bobbin for embroidery), is slipped over the first color to be embroidered and you can start embroidering. It is held the line of embroidery at the beginning for a few points and then once the embroidery is started, it stops the machine to cut the excess of this thread (if you do not, it may be taken in embroidery and then it will be harder to cut). When the embroidery of the first color is completed, the second coil is threaded and is repeated as before. This is done until the completion of the embroidery. Once the embroidery, the frame of the machine is removed, loosen the screw of the frame, and the fabric is removed. We cut small son protruding on top of the embroidery, but not those below unless the back of the embroidery is visible (as a scarf for example). Reinforcing the excess is removed by cutting around the embroidery and taking care not to cut the son. Tip: If you plan to stitch decorative stitches (as below) or a buttonhole near your cause, do not remove the reinforcement immediately, but cut it after doing your sewing because the decorative embroidery and buttonholes out better with reinforcements. You then left to spend your fabric with water to dissolve the water-soluble (dissolves mine to 35 °). And that’s a lovely embroidery done in less than 20 minutes!